Thanks for this release. I noticed that in the Changelog someone forgot to change "0.4.16 → 0.5.x (Not yet released)" to "0.4.17 → 0.5.x (Not yet released)". Can you fix it please? Awesome mod! 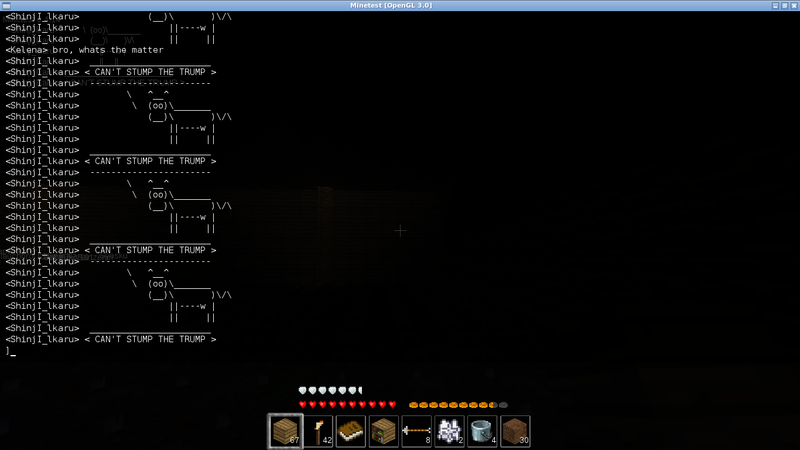 It solved all my shadow problems on my Minetest server. Thank you. Yes, it is useful for the "/giveme <ItemString>" command because it is hard to remind the <ItemString> of each item. Notice: I have just added to the first message of this topic chat commands provided by this mod. Oh... I guess the reset has happened during July - August 2016 because I was in holidays and didn't check the forum carefully. Well, OK I am waiting. Sorry, no new players being admitted at this time! I am not new on Xanadu, my player name is: YuGiOhJCJ. Re: How are the passwords hashed in auth.txt? Topic: How are the passwords hashed in auth.txt? SRP is not yet supported by Minetest World Manager. However, I have worked on SRP in order to understand how it works . I have successfully used SRP in a test program but it is not yet implemented in Minetest World Manager. I agree, an official announcement in this forum thread would be better. But it's never too late to create one here explaining what happened during these days.